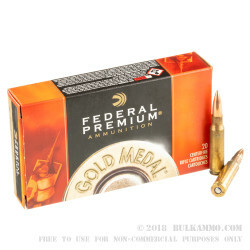 Sportsmen looking for 7.62x51mm ammo for competitive shooting will appreciate the craftsmanship of these Gold Medal rounds by Federal. 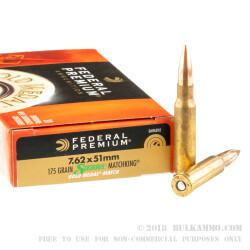 In addition to using their own premium in-house primers and powders, Federal suped-up the 7.62x51mm by topping the cartridge with a 175gr Sierra Match King hollow point boat tail (HPBT) projectile. These cartridges undergo strict quality inspection processes that ensure tight tolerances and extreme accuracy. 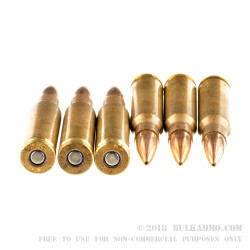 This premium factory loaded rounds have Boxer-primed brass casings that are new-production, non-corrosive, and reloadable. Established in 1922, Federal has over 90 years of experience providing American shooters with high-quality, high-performing ammunition for hunting, competition, and self-defense. 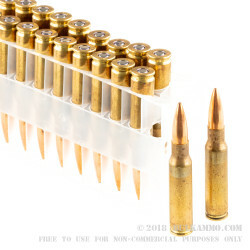 Order your 500-round case of this 7.62x51mm ammo today! Fired through a new DPMS G2 Recon. After two 20 round boxes of PMC with multiple failures to feed I ran 10 rounds of this with no issues. Shoulder fired. Excellent accuracy. Will be back for more of this.